Firstly I’d like to thank member msm0511 for his support in my other thread, “Thoughts about HomePod, AirPlay 2, and Subwoofers”, here on iMore forums. He was the only iMore forum member to reply to my posts and it has been greatly appreciated. I’m a live sound engineer with 30+ years experience, and an owner of nearly 12,000 watts of pro audio speakers/gear. The speakers are all modern with extensive DSP. My HomePod arrived on launch day and I was very impressed with its general tone...but even in the small caravan I live in one HomePod is barely enough. *please refer to my other thread, “Thoughts about HomePod, AirPlay 2, and Subwoofers” for more info rather than me repeating myself here. Without AirPlay 2, which was promised this year, and existed in iOS 11.3 betas until recently removed, I simply can’t play all my Apple Music to more than one device at a time. And forget true stereo separation even between 2 HomePods. The Whaale multiroom player app gave me a partial remedy, but due to Apples DRM restrictions I could only play music to multiple AirPlay receivers both Owned and stored on my iDevices. Not DRM protected music from Apple Music. 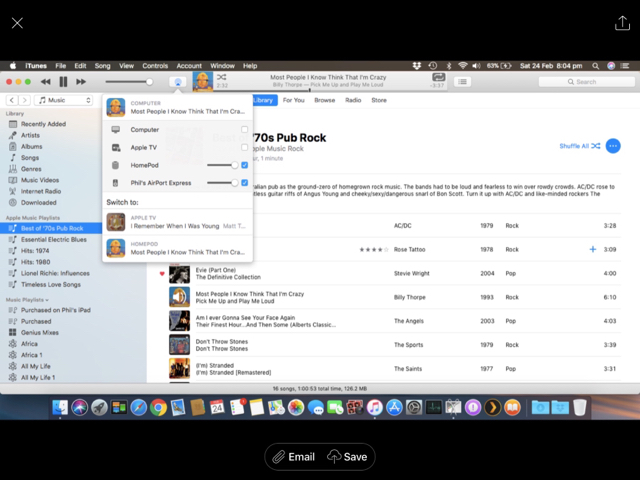 I have an old MacBook Air I rarely use, and booting it up tonight I discovered I can actually play ALL music to multiple AirPlay receivers which almost completely solves my issue with AirPlay 2 not being available yet. 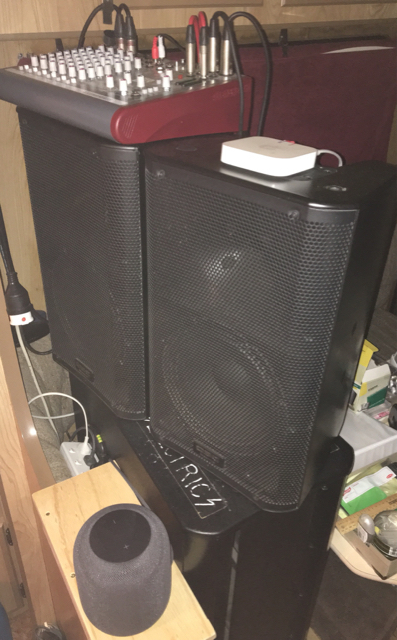 Currently listening to a plethora of music from Apple Music through both my HomePod, AND a 1000 watt subwoofer connected to my AirPort express via AirPlay. Hopefully my post helps someone in the same situation as me. Hey, thanks for the tip! Hopefully AirPlay 2 re-emerges sooner rather than later. Keep in mind iOS 11.3 is still in beta and it’s not unheard of for a feature to be pulled and then reintroduced shortly after. I think Apple probably realizes the importance of AirPlay 2 now that the HomePod is on sale. I think it is clear that Homepod was released too early. I hope the reputation Homepod is getting with the initial model does not wreck sales of new models with greatly expanded capabilities which are coming probably before the end of 2018. Saw some data yesterday and it appears that sales have actually been pretty good but of course can’t compare to other much less expensive speaker sales. I bought mine several months ago and am pleased with it (in a quite large space with part of it 2 stories—but it took moving around to find best location)—but do plan to buy a second for stereo primarily. I won’t buy a second until Airplay 2 so hope 11.3 does include it. I do believe this has dampened sales for the Homepod-like me, a number may be waiting for Airplay 2 to add a second—or even the first one. I’ve just updated my iStuff, and HomePod to iOS 11.4 and am currently listening to music played from my Apple TV to both HomePod and my old sound system (plugged into the audio out on my tv) via AirPlay 2. However, this configuration has a very noticeable audio time lag between the two sound systems, which is not very pleasant. Hopefully upon adding a second HomePod instead of using my old speakers this lag should disappear. Fingers crossed. I’d also like mention there is currently no update available for my AirPort express to allow it to function as additional target for AirPlay 2 audio. I hope Apple decide to add this functionality soon..
By BBerryPowerUser in forum New to the Forums? Introduce Yourself Here! Is app that would add clipboard to the stock iphone keyboard?